This lighthearted and reflective account was written for the author’s daughter to give her an insight into her mother’s early years of training. Originally meant as a maternal hand-me-down, the book provides a nostalgic read and will be of interest to those working in the nursing profession as well as readers who enjoy a historical romp. Maggie trained as a state registered nurse and went on to pursue a varied and rich nursing career at some iconic destinations. The book highlights the difficulties and challenges of being a nursing student. 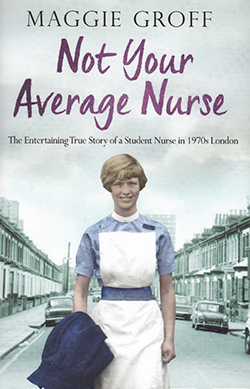 From the notorious equipment cleaning duties, life in a Nightingale ward, the respect that had to be shown to senior staff, the camaraderie and rule breaking between students to the caring approach displayed to provide patient centered care, the author shares it all in a humorous and compassionate way. Set in London King's College Hospital in the 1970s, when schools of nursing were local and clinical skills were taught and practised on site, some scenes are reminiscent of my own training in the 1980s. Advances in care are highlighted, especially in relation to medicine, surgical and obstetric practices and recognition of the need for nurse specialists appears to date back to this era.